The HTC Elation appears to have leaked online in what seems a bit of an own goal by the Taiwanese manufacturer. 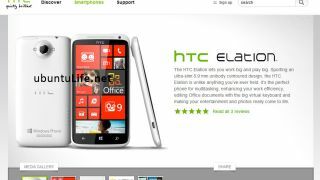 Ahead of its press conference on Wednesday in New York, Ubuntulife claims HTC has posted details of its upcoming flagship Windows Phone 8 handset on its own website. Originally rumoured as the HTC Zenith, the Elation looks to be the final name for the smartphone touted to sport a 4.7-inch HD 720p super LCD display, 1.4GHz quad-core processor, 1GB of RAM, 32GB of internal storage, 8MP rear camera, 1.3MP front camera and running Windows Phone 8. The product page on the HTC website which reportedly revealed this information has now been taken down, but if correct the Elation is set up to be a more powerful device than the Android-driven One X. We'd be surprised if the Elation did pack the quad-core processor the captured screen grab claims it does, as Microsoft has made a point about its operating system running happily on dual-core devices. Plus we've already seen the Windows Phone 8-running Samsung Ativ S, Nokia Lumia 920 and Lumia 820 unveiled, none of which have four cores inside them. HTC's press conference kicks off at 4pm UK time (11am New York) on Wednesday, and TechRadar will be bringing you all the information live as it's announced.